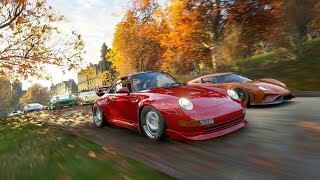 We are all excited about FH4 and it is really all it's hyped up to be. When you start your Horizon Life career off you will have to gain enough influence to qualify for the next season. These first qualifications will be remotely quick. It is like a preview of what is to come. Fall, winter, spring and summer. As you go on finishing races which include dirt, street or sprints, you will gain the influence that you need to move onto showcases which will allow you to race into the most beautiful visual graphics you have ever seen thus far. The snow seems so real that you can see it glitter in the sun. your car will have dirty snow just caked up on the sides of it while you are able to see the bits of debris shredded up into the air. You can see everything. Spring will bring you lots of puddles that will make racing a little slicker when it comes to controlling your car. Mud puddles and wet spots on the road as you fly by the scenery that speaks volumes of beauty and magnificence. The flowers will be sprouted and the wild life just springing to life, get it, springing. Summer, aww man it is great. Tractors set out as if they are parked after finishing a hard day's work. The scenes of summer are just so obvious wherever you go. Whether that be Edinburgh, Arthur's Seat, Glen Rannoch or near the beautiful bodies of life at Derwent Water. Fall is my favorite. The orange, yellow and red leaves that hang high above on trees or falling onto the road as you drive. Bright vibrant landscapes filled with crisp views like candy for my eyes. Each season has its own set of events and Barn Finds. On your dash board when you first jump on, you will be presented with what special events are open specifically for that season. It may be driving special cars, doing some event with a friend, but they are directly tied to the season you are in. Seasonal Barn Finds will be purple inside just like the regular finds, only you will see the colors of the season around the hue. I went right away and found them when I saw it, so I do not know if these go away. I can only assume they are of a limited time since they are seasonal. Let's start off with me telling you that each event has their own LVL system. 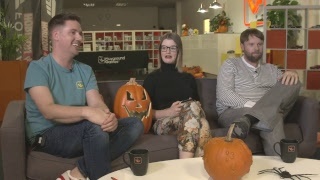 So, the Dirt, you do the events and you will specifically level that series up and earn specific rewards for said series. With that, let's list what the events are. Dirt Racing Series - Dirt speaks for itself does it not? I have the Impreza WRX STI 2005 Subaru. It is my baby. Even though I got it for dirt racing I use it for almost any event I am allowed too. Dirt Series goes from pavement to dirt paths. More of a rally event you ask me. 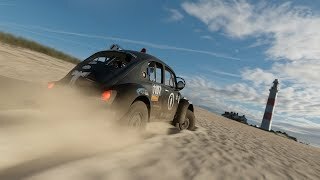 Shredding dirt and literally leaving my opponents in the dust is beautiful. Road Racing Series - Sprint and Circuit races can be found in these events. Road, pavement, black top. Rubber and the street meet, and it is all pedal to the floor. Not all cars are meant to be driven on the road and you will become aware of which ones can be used in different series and which of those that cannot. Cross Country Series - Off road. Take across the landscapes of the UK. Through the trees, the grass and over the hills. 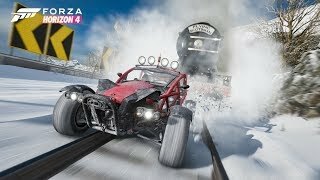 Offroad Buggies are mostly driven in these events. Street Scene - The night life and illegal racing. What a combination. The thrill of it for most is unexplainable. Showcase - In Showcases you can find all kinds of odd vehicles to race. A few for example are, a train, dirt bikes, hovercraft and a freaking jet! These show cases usually lead to a lot more races and series that will pop up on your map after completion. 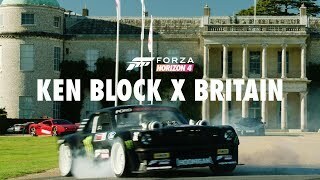 Drift - Drifting in FH4 is a little different for me because you cannot just drift in any car that you want and score a lot of points. You must make a car made just for drifting or win one. Now yes, you can drift in any car really, but you want Formula Drift cars if you want to score big points in drift zones. It is not the easiest to drive these formulas around the map as if you were taking a cruise. It's hard. Sliding all over the place will occur. There are many, many more events. These are just a few that I have named. So there really is not a limit on fun here. I mean there is so much to do that I got lost more than a couple of times looking at the map trying to figure out what to do next. There are a lot of these boards just laying around, most are reachable just by driving up to them and smashing them. Fast Travel boards or for fast traveling. You can travel to certain places on the map and it will cost you CR, which is in game currency used to buy cars, homes and upgrades. Fast traveling will cost you a certain amount of CR depending on how far you travel. If you are FT to some place near you it will cost less than it would to travel a further distance. There is a great end game with these FT boards. When you get all of them you will be able to FT for free. Now as I mentioned earlier most are easy to get, others are not. Some may be on houses. To reach these, you will have to use hills and ramps. Look good because they are hard to find. Influence boards vary from 1,000 influence on to 5,000. The higher influences, wouldn't you know it, are found on top of the architectures. So, there are the objective to reach both boards on top of things. There are around 250 boards in all. You can spot this also by using the drone and from there they will be marked on the map for you to find. These are Special finds and I'm sure every player finds the same cars no matter who you are. What I mean by that is, when I found the Subaru, I'm sure you would find the same car in the same spot on your console. What I am not sure of are the seasonal Barn Finds. Those are a little different and pop up randomly. So those may be different if you don't find them in time, maybe you won't be able to find them again until that season comes back. You will know when they are seasonal because there will be a different colored hue around the already purple circle. 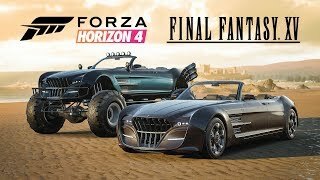 In my experience the best way to find these rare cars is to use your drone. The drone is in your dashboard. It can be used to do anything, but most useful to find boards, barns etc. These dang Barns are hard to find. Mostly they will be surrounded by trees and will blend in with the seasons. These Barns are long and round. They have rust on them which will most of the time blend in when it is fall or just in summer or spring because it also has the color of tree bark on them. One of the barns took me maybe a good 20 to 30 mins to find it. I had gotten a hint from a friend where if you find a beaten path, follow it and you would find the barn and I did. In some cases, it is not that easy. Sometimes there are multiple little beaten paths and you can't easily find the hidden barn. You will get some great cars out of these Barns which include a Peel, Mini Cooper, Subaru, Jaguar and many more. After finding the car it will take some time for them to be fixed and become able to drive. When you find them, they are in bad shape and left to rust. Here you have the option to shave off a couple seconds of 0-60 time or the ability to cram more MPH into your ride. Now, I have not fully dived into this option, but I have done enough to make my Impreza go from 192 to 200 MPH. what I did was messed with my gears and aero dynamics. The gears, if you are not used to Forza in any way or have never fine-tuned a car it will be a little difficult. It is well worth it to tinker with these options if possible. 10 more MPH will make a huge difference. Be careful when messing with your gears because you may end up in a situation that I had with my car. My friend Jamie, AKA TheDuneWhippet, once borrowed my car in a race and asked me what was up with my car. I asked him what the problem was, he then told me that my 3rd gear was not there. Basically, when he drove my car the gears went from 2nd and skipped 3rd and went directly to 4th. What I figured out was that when I was packing power into my car by fine tuning my gears was that I had my 3rd gear way too close to my second. The outcome was that I could not drive in 3rd for long at all which then made me lose some speed by not being able get those well needed MPH. if you go from 2nd gain 20 mph and go to 3rd and only able to gain 2 or 3 MPH before shifting, you are losing out on 18 or 19 MPH. That is bad. You need every inch of speed you can. Custom Upgrading is where you install roll bars, tires, exhaust, lift or drop your cars height etc. all of this does matter and especially when you put on a body kit which includes, Spoiler, side skirts, front and back bumpers. Some of these options will slow you ride down or make the handling better. You must be careful what you do and how you do it. The customization in the Paint and Vinyl departments are monumental. So many ways to make designs and you can share them with the world. The paint colors are many including special paints. Damascus to carbon fiber and rose gold or oil colors are available to stick on your car. These effects go all the way to making your car look like it was made from wood. Logos from Monster to Hoonigan. I have a pretty good skill set when it comes to decking out a ride on a game. I love it. The rims, there are a lot also, but what this game is really missing is the option to have multiple body kits. At best you only have two to 5 for a car and some don't really go past three. The rims have more variety and that is awesome because who doesn't like rims? To me though, a body kit makes a car also. A little disappointed that there are not many options, that is a big bummer to me. You will see that when you start making your car and giving it a custom upgrade that you can Auto Upgrade your vehicle. Auto Upgrade will allow you to jump classes. For instance, if you have an S1 class which is 800 and above, but you want your car to be S2 which is 900 and above, you can Auto Upgrade to that specific class. S1 and lower are slow cars but there are events that require them. For the most part you will find S1 and S2 class races. We have the Standard Edition with pre-order, which includes the "Forza Horizon 4 Formula Drift Car Pack". The game by itself is enough to make a person happy. The game is brilliant. The Deluxe Edition comes with the Formula Drift Car Pack and the Car Pass, which gives you two new cars a week for the period of 21 weeks. The car pass is awesome, free cars is a steal. While I have played, owning the Ultimate Edition, I have already procured a bunch of cars. 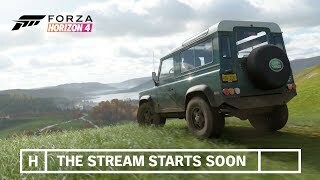 Ultimate Edition gives you the Formula Drift, Forza Horizon 4 Car Pass, Forza Horizon 4 Best of Bond Car Pack, Forza Horizon 4 VIP and Forza Horizon 4 Expansion 1 & 2. That is a lot of bonuses. 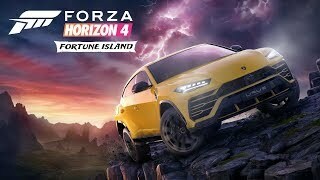 I know not everyone can afford that type of money to go and spend on a game, but if you like Forza you will end up missing out on some good stuff and more than likely end up buying the DLC content like the expansions anyway. I highly recommend this edition. With being a VIP member, you get more influence and two Super Wheel Spins a week. Super Wheel Spins give you three prizes rather than the regular Wheel Spin which gives you one prize at a time. Buying my first home being a VIP member, it was free. Some houses are expensive. Like the Edinburgh Castle. Fifteen Million. Another was about one hundred and fifty thousand, but with the purchase you get Super Wheel Spins. Your houses are going to really help you with Fast Traveling. If you do not FT you will be driving some distances to get to your objective, which is not a bad thing because you just have to see the scenery. Every inch of the map is beautiful! In your home you can upgrade or customize your cars instead of having to go to the Festival to do it. This is also where you can customize your character with the prizes won from Wheel Spins. There are a lot of items to choose from. They range from shoes, hoodies, shirts, pants, glasses and watches. In order to get these clothes, you can either LVL up in racing series or you main progressive LVL as a whole and Wheel Spins. My character had skinny jeans on when I first started, you can only imagine how happy I was to put some regular pants on him. You can also get costumes which are suits and ties and other funnier items. Homes are all across the map and you have to find them by driving by and discovering them or finding them on the map. Playing with your mates online can really benefit you due to the fact that some events require you to have a teammate. Create a team through your dashboard. Very simple and very fast. You get bonuses while racing and playing games. Play through unranked events and reach LVL 3 racing and you can then go on to racing ranked matches. You will be rewarded for gaining ranks for you team. Exclusive prizes are acquired from doing so. You are able to beat your teammates high scores on Danger Sign events and others. Don't be afraid to reign supreme when it comes to smashing your buddies' records. There are so many ways to enjoy your friends' companionships. When you put a way point down while with a friend, use y to mark it so you can both see it. You can also do Head to Heads. You or your teammate can start it at anytime anywhere. It is basically a sprint that appears out of nowhere and you both then take off and race each other. Live events will pop up on your screen when they are available. Race and go do the Live event or it will disappear. While there you will notice that you are not the only one taking part. Other players will be participating and with that in mind do your best and shoot for first. This is a great way to earn CR and Influence. A convoy can be formed through either inviting someone you know or by asking a random. You can meet some real cool people. Online just has a lot to offer. As I mentioned before there is loads to do and it seems that there are unlimited events. To this day, I have never played a more beautiful game. As you drive through the cities and towns you can see the reflection of the buildings on your car with vivid detail. Whether you are driving on snow, dirt or through the mud you can see the debris fly up from under tires into the air. Cosmetic damage is a great detail to note. You can damage your car by running into structures, trees or what have you and your car will begin to look wrecked. The glass on your car will crack, the muffler can be torn off and the paint get scraped. Such magnificence. Blades of grass and individual flowers can be seen even at top speeds. There are a couple spots while it is summer where fields of yellow flowers are stationed and driving through it is like nothing I've seen before. The water is so clear, the waves and depth can be seen from afar. Every detail on the rocks in the quarry are dead on. The cars themselves are just so realistic that you can see the stitches on the seats and the rubber grooves on the tires. While driving you can even see your character shift gears. The fact that night and day occur in this game and the smallest features change as does the lighting from the sun and the moon goes to show what great lengths Turn 10 Studios went through to make such a great game. My fiancé even noticed how much time I was putting into this game and it wasn't in a bad way. She said that I haven't played a game like this since D1. I have been hooked. I don't see myself stopping anytime soon. With over 400 vehicles to choose from and the various types, there is plenty of gameplay still left. From Trucks, Hyper Cars, Formula Drift, trucks and even vans. I have never seen so many vehicles in one game. This is the most fulfilling game I have played. 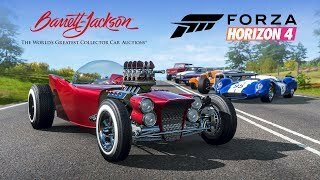 I recommend this to anyone who enjoys past Forza games or any racing game for that matter, FH4 tops them all.